There are two ways to avoid flying your fleet into a trap. You could outwit and outmaneuver your enemy once the trap is sprung, but alternatively, you could assemble a fleet that can respond more swiftly to your commands—allowing you to steer your ships out of harm's way, even at the last moment. Either way, you'll find that the 2018 Season Four Tournament Kit for Star Wars™: Armada offers a range of valuable upgrades to help you better avoid your opponent's trap and, possibly, snare them in your own! So as you and your opponents head into the thick of battle during 2018 Season Four, you'll find plenty of reasons to stay on the move, to maximize your fleet's responsiveness, to experiment with the unexpected, to unleash a whole new arsenal, and to expand your talents as fleet admiral. Who knows? Your changes may even catch your opponents by surprise and improve your chances of claiming the season's top prizes! Season Four Organized Play for Star Wars: Armada finds the Galactic Civil War still raging across the galaxy. 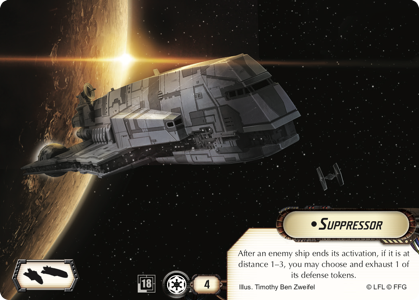 Rebels and Imperials continue to meet in ferocious battles for key star systems and objectives, and the prizes in the 2018 Season Four Tournament Kit support both sides equally. This means you'll have plenty of reason to head to battle, whether your organizer runs Fleet Patrol tournaments or schedules some other form of event. You'll want to win these prizes for your cause and keep them from falling into the wrong hands and bolstering enemy fleets! 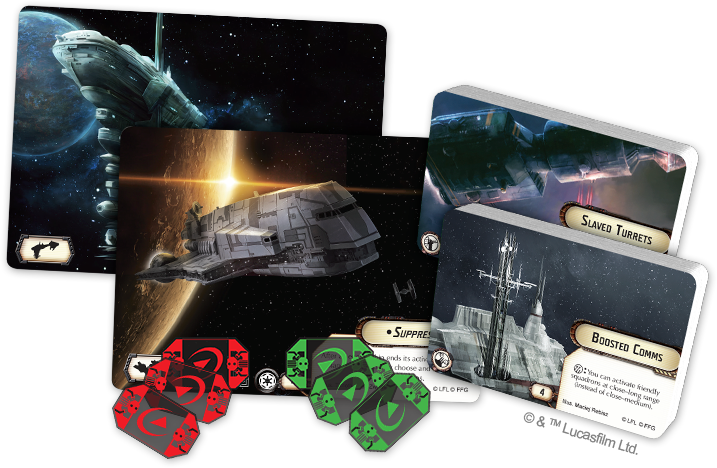 The Tournament Kit contains seventeen copies of a double-sided extended art upgrade card that you can use to enhance your fleet. 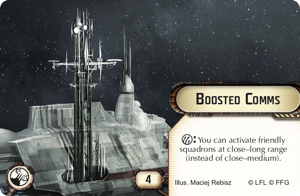 One side features the Boosted Comms upgrade, extending your ability to command your squadrons all the way to long range. The other side features the Slaved Turrets favored by ship captains who prefer to stay at long range and attack their foes from a single firing arc. One copy of this card is intended for the tournament organizer to keep or distribute as he or she sees fit; the other sixteen are to be awarded to participants in the season's Organized Play. At a Fleet Patrol tournament, the Top 16 players should each receive a copy. Ships need more than comms systems and weapons; they need names as well. A good name can inspire the ship's crew, or it can invoke terror among your enemies. After you upgrade your ships with the Season Four Core Prize card, you might aim to title your Nebulon-B frigate or Gozanti-class cruiser, using one of the titles from the double-sided Elite Prize card. 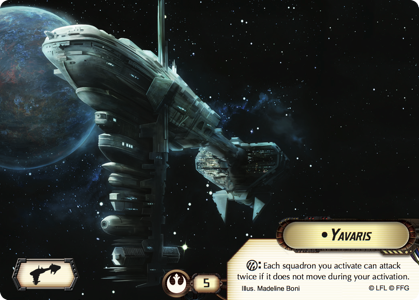 Printed at the same size as a standard LCG® card, this card features extended art on both sides, with the reliable Yavaris title on one side and the Suppressor title on the other. 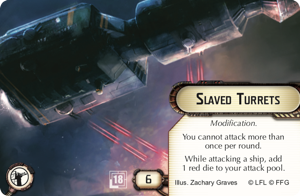 At a Fleet Patrol tournament, these elite prizes are awarded to the top participants in the order of their finish, with each choosing to claim either one copy of this alternate art card or one set of the tokens awarded as the other elite prize. The 2018 Season Four Tournament Kit comes with two sets of three acrylic redirect tokens—green on one side and red on the other. As you look for ways to get your ships safely through your engagements with enemy fleets, these are bound to come in handy! 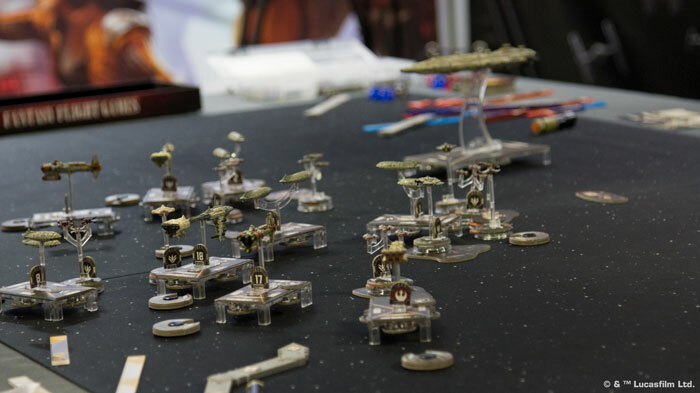 As the game of epic Star Wars fleet battles, Star Wars: Armada demands you plan well in advance of your maneuvers—even well in advance of your engagements. After all, your Mon Calamari cruisers and Star Destroyers are far too massive to respond swiftly to the threats they encounter. It falls to you to plan intelligently and build flexibility into the remainder of your fleet. What mixture of ships and squadrons will serve you best in the coming battles? Now is the time to experiment and take your rivals by surprise. Talk to your local retailer about getting involved with Season Four Organized Play for Star Wars: Armada!